Purchasing hardwood flooring for your home is a big investment that will reap many rewards. Not only will it improve the overall look of your home, but it also is sturdy and lasts longer than tile or carpet, and it will increase your property value if you ever decide to sell your home. Many homeowners have seen hardwood floor installation performed on home improvement television shows and are given the impression that it is a fairly simple task that they can do themselves, but this is not the case! There are many factors involved in wood flooring installation, and it should be left up to the professionals at Sandy Springs Hardwood Flooring to ensure it is done accurately and efficiently. Solid wood flooring is created from single planks of hardwood that is then coated with a clear protective layer to help minimize damage to the surface. Because the planks are thick strips of solid wood, they can easily be sanded down and refinished many times during their lifespan. 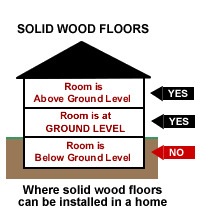 Solid wood planks typically expand and contract with changes in humidity, and should not be installed in rooms that are high in humidity such as basements or bathrooms. Not only is solid wood flooring a beautiful choice for your home, but it is also very durable and will last for a long time. A real wood floor can be sanded and refinished over and over again before it needs to be replaced. Solid wood flooring planks can be made from various tree species, giving you many different options of colors and textures, and you can also choose from numerous stains and finishes, allowing you achieve whatever look you’d like for your home. From smooth and classic to rugged and modern, Sandy Springs Hardwood Flooring will help you choose the right materials and finishes and install them flawlessly. Oak: Dense and hard, oak brings a sense of warmth into your home with its color ranging anywhere from pinkish tan to rich golden brown. Hickory: This is one of the hardest and toughest flooring materials and ranges in color anywhere from light blonde to dark brown. Walnut: Walnut is sturdy but is a lighter and softer wood than other types. It has a rich, dark brown color with distinctive grains. Maple: This wood has a very uniform texture with straight grains and comes in colors such as cream or golden beige. Cherry: Cherry has a very smooth finish with small grain and can be either light reddish brown or creamy light pink. If you’re looking for a long-lasting, attractive way to update your home, Sandy Springs Hardwood Flooring is the best wood flooring company in the area to do the job! We wipe the floor with our competitors when it comes to professionalism, affordability, and finished product. Give us a call today at (404) 341-7071 !